Usually, the conventional front door lock is enough to secure your front door. It has been tried and tested and has proven to be fine for centuries now. However, technology has just made significant improvements to the lock and given birth to the “smart door lock” that gives new dimensions to the convenience, security and utility of a lock. A smart door locks give you the chance to open your front door without having to put down the groceries you are carrying, give access to your relatives and Airbnb clients when you are not around by simply just giving them an access code. 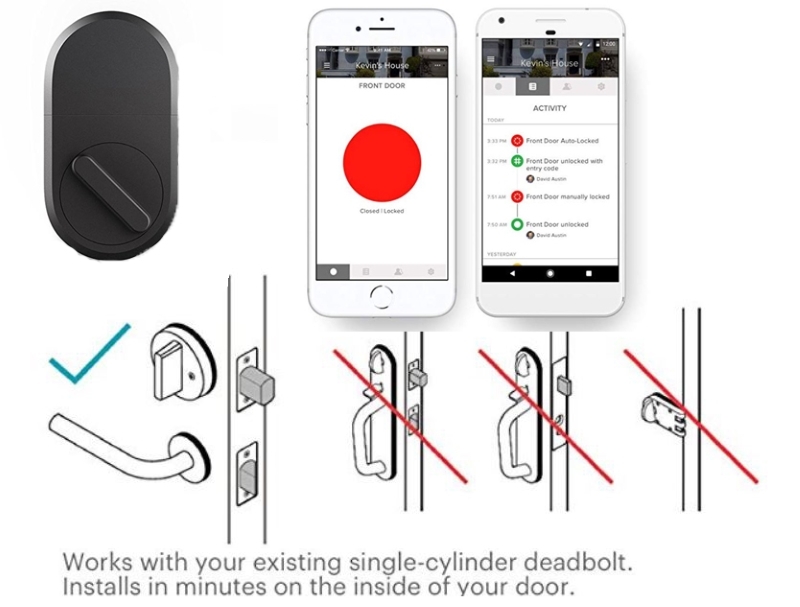 The smart door lock allows these accomplishments because of wireless technologies that include the Bluetooth and Wi-Fi, which give you the control over the smart lock from any place you wish to connect to the internet using the lock smartphone application. Once the smart door lock has been paired successfully to a smartphone using Bluetooth, it be locked and unlocked without the use of a key. At Wireless Security Camera Solutions, we give you the best of this new lock technology that comes in such great variety. Different makes, models and features have different operations and as such you can open by waving, turning the smartphone in front of the smart door lock, touching the lock with a finger, tapping a certain control in the app, approaching the door or even talking to it. Other locks are automatically programmed to bolt behind as you take leave. The smart door locks provide an opportunity for these keyless and unlock options combinations. Newer models include the smart door locks with cameras that have an engrained camera that can be used to verify your identity. Some of these locks are opened by sight, all you need to do to either lock or unlock is look with a given eye at the camera on the lock. Smart door locks with cameras are very secure because only you can open them. However, they limit access to only one individual meaning every other person that is Okayed by you to have access cannot access what is behind the door. Perhaps, the best one is the Wi-Fi smart door locks that are not necessarily locks but padlocks enabled by Bluetooth. The Wi-Fi door locks have a built in Wi-Fi circuitry or rather a Wi-Fi bridge controllable from every possible place as long as they remain connected to the home router. But it is worth mentioning the Alexa control smart door locks. For some time now, there has been a debate on whether Alexa control door locks are effective? A smart door lock Alexa is a lock that integrates with other home devices like the smoke alarm. A door can thus be triggered to open when the smoke alarm is set off and even go as further as having smart lights turning on when the door is locked. The smart door lock Alexa is an improvement to the conventional or usual smart door lock because it guarantees an exit plan for inhabitants and owners.